This archers sword has a pommel and guard made of steel. 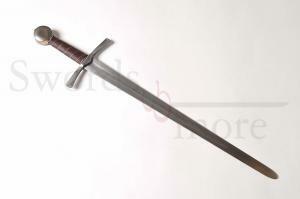 The long handle and the excellent balance make this sword very fast and dangerous. The forged high carbon blade features a hardness of 48-52 HRC, has no sharp edges and is fully battle ready. These swords are top-quality battle ready swords. They are likewise suitable for beginners and advanced fighters looking for a sword with a good price-performance ratio and great durability. All category 3 swords feature high-quality carbon steel blades which are tough and flexible at the same time. When used against other blades they show hardly any scratches. The pommels are riveted at the end of the wide tangs.